A score for a documentary is a very tricky thing. Documentaries are certainly subject-driven and intended to illuminate and educate the viewer. I have read, in the past, that “purist” afficianados of the Classical music genre often decry film music as being “too manipulative”, though this strikes me as something of a quandary, as I find music intentionally evocative. Taking an auditory medium and aligning it with a visual medium steps too far beyond the acceptable for some, however. Film music intends to make the view feel something, if only subconsciously, about the subject being viewed. But in a documentary, which strives to tell a story, albeit a non-fiction one, is music still manipulative, or does it fill some other void? 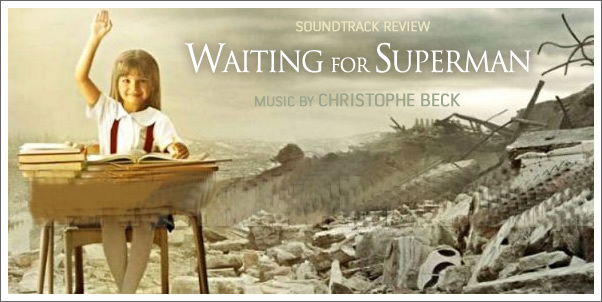 CHRISTOPHE BECK’s WAITING FOR SUPERMAN made me ponder exactly what purpose the music fills in a documentary, and whether that it is intended to stand alone, as music. Even as a film music listener, myself, I know that seems to smack of heresy. But I’ve heard a few documentary scores before, from the haunting (Phillip Glass’ “Fog of War”) to the epic (Howard Shore’s “Looking for Richard”). Beck’s “Waiting” tends to lean more towards the Phillip Glass end of the spectrum, being sparse, gently repetitive, and at no point overwhelmingly emotive. Good thing/bad thing? Depends on what you want out of music, film music in particular.